The Pro 1.0 builds on the capabilities of the 0.5 by adding a triangle bandage, wound closures and an expanded inventory of bandaging supplies and medications. A pencil and patient assessment form assist in record keeping when evacuation is delayed. A solid line of defense for small parties traveling overnight. Group size: 1-4. Trip length: 1-10 days. The Pro 2.0 dramatically expands the focus of the 1.0 with the addition of the versatile SAM splint, Green Soap scrub sponge, for aggressive wound cleaning, additional bandaging and burn supplies and more medications. Comprehensive supplies and a practical design make the 2.0 suitable for extended travel to remote areas. Group size: 1-5. Trip length: 1-14 days. 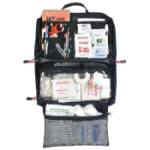 The Pro 3.0 provides maximum first aid capability in a pack weighing under 2.5 pounds. The addition of a Bloodstopper dressing, #11 scalpel, and extra quantities of all consumable supplies, provides expedition-length coverage. 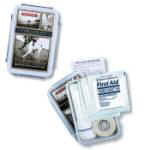 Designed for medium-size grThe Pro 3.0 provides maximum first aid capability in a pack weighing under 2.5 pounds. Designed to treat almost any wilderness or urban injury. Content features include wound closures, trauma dressings, triangular bandage, bandage scissors, protective gloves, backcountry first aid instructions. 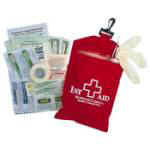 Essential first aid in a handy package. Content features include Voyageur zippered drybag, sting relief pads, electrolyte tablets, sunscreen, forceps, Telfa non-adherent dressing, moleskin. 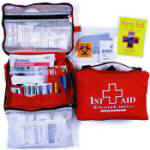 A basic first aid kit in a watertight case. Content features include fabric adhesive strips, Telfa non-adherent dressings, protective gloves, antibiotic ointment and instructions. 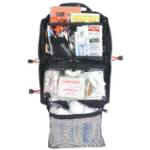 Designed for prolonged backcountry or expedition use. 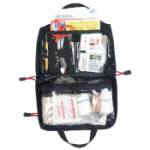 Content features include wound irrigation syringe, trauma dressings, iodine solution, wound closures, adhesive tape, wire mesh splint, EMT shears, triangular bandages, Personal Protection Pack, backcountry first aid instructions.